One of the items on my Christmas wish list was an iPad case, to replace the functional yet boring black number I bought at the same time. Well, Christmas came early when Caseable offered me my choice of their hand-made, customisable cases. The company offers everything from smartphone to laptop to eReader covers, all of which are handcrafted in Brooklyn or Berlin. Customise your own, using your own text, images or design, or choose artwork from a range of featured artists on the site. Either way, the order process is quick and easy, using the online system - it takes about 10 minutes, and a week later, my case was in my hands. I opted for this striking skull design by Ali Gurec, a designer and illustrator from Istanbul - I love it! 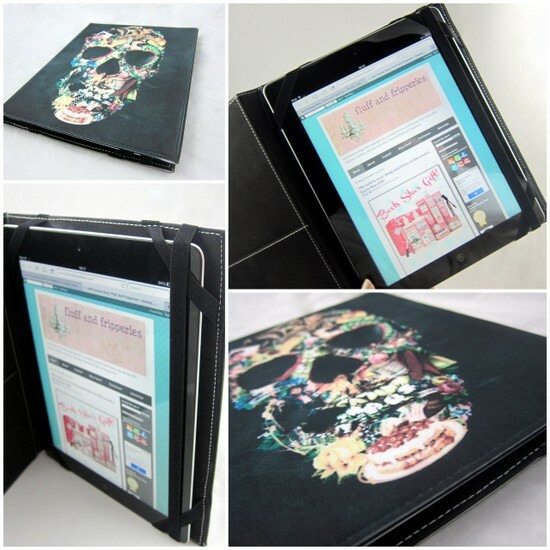 The design is gorgeous, I love the distressed black background and the sturdy, well-made case fits my iPad perfectly. I think it's worth every penny of the €49.90 pricetag and if you're after something that's customisable and unique, I'd encourage you to check out the rest of the options on their site, here. And here's a little treat for you if you spot something that you'd like - Caseable are offering readers of Fluff and Fripperies a 15% discount that's valid until midnight on December 31st. Just enter the following code at checkout: fluffandfripperies10. I love the design you chose Emma. I just have the boring Apple black one!!! You designed the cover? That is SO cool Emma! A custom iPad cover would be so awesome! That looks incredible. I love the design and the colours are really amazing. Thanks for your lovely kind comment...I love this idea of customizing your own case, i would probably spend hours just picking out a design...the one you picked out is so amazing, love the print. Thanks guys, it's a fab site, you should check it out! Love the idea of personalising one's case, hmmm, I'll have to start getting creative now! Love the design on this case! It's just like one of the scarves I have! Cheers to your rock soul! !I love everything customisable,great idea! !